Blossom end rot appears in mid to late summer just as those delicious red tomatoes begin to ripen. First symptoms resemble soft, moist spots under the skin of the green tomato, but may be overlooked. As the tomato begins to ripen, the spot enlarges, darkens, and eventually results in a soft, black, sunken area in the tomato. 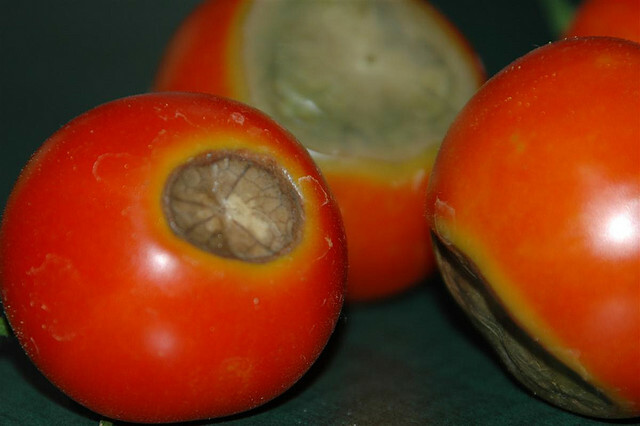 Many mistakenly believe that blossom end rot is the result of disease and worry that it can be passed on to other plants or to neighboring gardens. Blossom end rot is caused by a calcium deficiency and cannot be passed on to other plants. If blossom end rot isn't a disease, why does my neighbor have the same thing? The answer is simple. Without adequate moisture, tomatoes cannot uptake the calcium in the soil. This means that you can get blossom end rot even when you have adequate amounts of calcium in the soil. In hot, dry seasons, tomatoes are susceptible to blossom end rot, explaining why your neighbors may be experiencing the same thing in their garden. The trick, of course, is to provide the moisture your tomato plants need to uptake calcium. During hot, dry summers, particularly at fruiting time, tomatoes require 1 ½ inches of rain a week. When rainfall does not provide enough moisture, supplemental watering is required.Tomatoes grown in raised beds or containers may require daily watering to meet their needs, as tomatoes are heavy feeders. Water to moisten the soil to the root level whenever the soil feels dry to the touch one inch below the surface of the soil. The Alabama Cooperative Extension recommends several measures to control or prevent blossom end rot in tomatoes. Maintain a pH between 6.0 and 6.5. The pH of the soil affects the available nutrients. For best nutrient uptake for tomatoes, test the soil often and amend as recommended to maintain the pH level. Follow the fertilizer application rate as indicated by your soil test. Too much fertilizer at one time may contribute to blossom end rot. Use mulch to conserve moisture. Black or red plastic is preferred, but any mulch will do. If you choose not to use plastic mulch, straw or a layered newspapers work well, too. Water consistently keeping the soil moist. Do not allow soil to dry completely before watering. Treat plants with blossom end rot with a calcium solution. Mix 4 level tablespoons of calcium chloride to a gallon of water and apply to the soil beneath your tomatoes. In areas where temperatures reach into the upper 80's and 90's, use calcium nitrate instead.